Me: Can I fetch you books, or paper or something? wish someone would adopt Andromeda. eternally playful. …Will you stay in bed today? forgiving. … Have I ever told you of the carpet fluff song? was (coughing) …novel. I see why you like it. I’ve not heard a banjo like that. a ukulele. It’s a Hawaiian instrument based on a small Portuguese guitar. Me: It is. I should go and find breakfast. What would everyone say is the best horror movie of 2018? 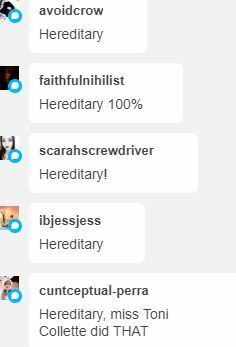 Wow the Hereditary gang really pulled up. I wouldn’t say it’s my favorite (it emotionally wounded me and I never want to watch it again) but it’s extremely well done and hella scary.